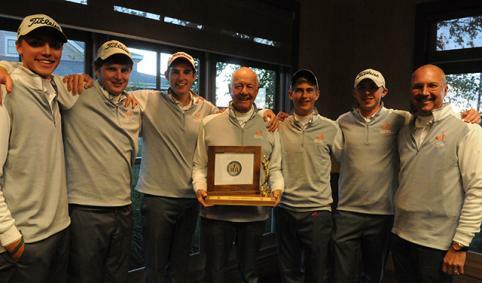 The Hope men’s golf team have won the 17th Michigan Intercollegiate Athletic Association (MIAA) championship in school history. Coach Bob Ebels' Flying Dutchmen on Monday (Oct. 7) , won the final 18-hole jamboree by one stroke at Watermark Country Club in Grand Rapids. It was the fifth time in eight events this fall the Flying Dutchmen took first. They finished 21 strokes ahead of runner-up Calvin by posting an average of 304.4. The 11th MIAA title in 14 seasons qualified Hope to host the final two rounds of the league’s 54-hole NCAA Division III National Championship qualifier this spring. Calvin will field the first round of the four-team tournament that includes third-place Trine and fourth-place Adrian. Junior Collin Breit of Muskegon (Western Michigan Christian HS) topped Hope at Watermark by carding a 4-over par 76 that tied him with two other golfers for second place. Breit came in one stroke behind medalist Chris Williamson of Alma. Junior Ben Lanting of Littleton, Colo. (Front Range Christian HS) and freshman Winton Munch of Traverse City (Traverse City Central HS) shot 78s to tie for eighth place. Junior Ben Lewis of Grand Haven (Grand Haven HS) gave Hope its final scoring round with an 81. Junior Evan Telzerow of Grand Rapids (Forest Hills Northern HS) carded an 83 for the Flying Dutchmen. Munch clinched the MIAA Most Valuable Golfer honors. He averaged 74.1 over seven tournament — a half-stroke better than second-place James VanNoord of Calvin. Knickerbocker Theatre Shows Film "Austenland"
The Hope College Knickbocker Fall Film Series is presenting the romantic “Austenland” thru Saturday. Hope College has celebrated many scholar-athletes and teams over the years, but never a scholar-mascot. Well, this might be stretching it a bit, but still we are proud that Dutch is being recognized in a national initiative.